and in my experience it works really, really well. What I like about it is mainly the fact that I can implement and manage the whole thing via PowerShell. I run up a lot of demo environments and have an automated script that adds a custom domain to Office 365 and then adds the required DNS records to Azure. All that happens at the touch of a button, consistently. Brilliant stuff. that the total estimated cost for 1 DNS zone with 1 million queries is AU$1.24 and I will note , also includes support! So how does such an estimate translate into the real world? Well, I host a number of domains in Azure DNS but the most active one would be ciaops.com. The DNS records for this very blog are there. 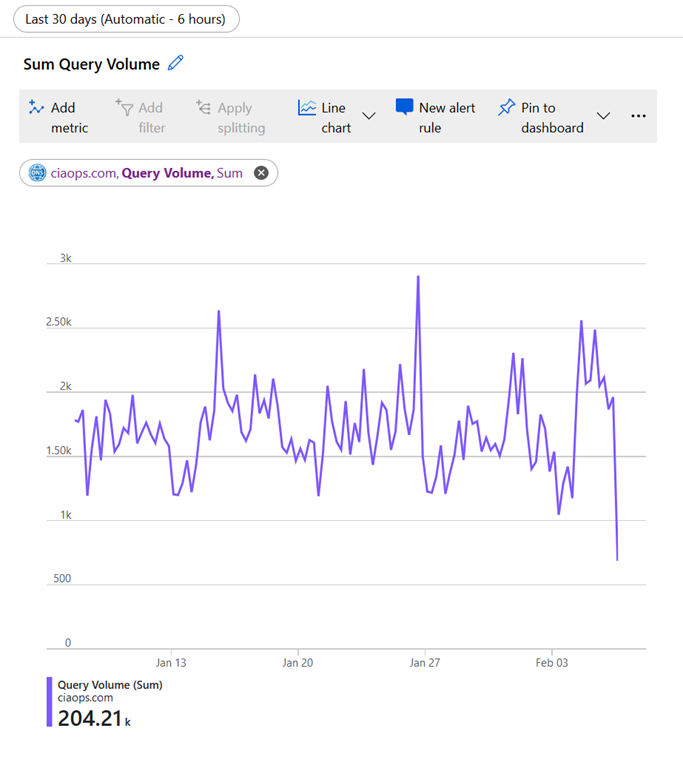 So the next really cool thing that Azure gives you is the ability to drill down into your services, like Azure DNS, and produce information like what you see above, which is the total queries against the ciaops.com domain in Azure DNS. The amount for the last 30 days was 204,210 requests, well below the initial one million estimate. Clearly that amount will vary for different domains based on popularity, but remember that not every DNS request for your domain will hit the root DNS servers for the domain, especially if the records don’t change that much. So I then used Azure to show me the actual cost for this previous 30 day period and you can see that the grand total was AU$0.37. Sure Azure DNS is not free, but it might as well be! So, if you are looking to get started with Azure, I’d suggest that you start with Azure DNS as being the cheapest, quickest and easiest way to dip your toe in. That will provide you some familiarity and from there you can start scaling up.